Australia and Oceania is for us a paradise on earth. There is no other continent where you can find so many islands as there. 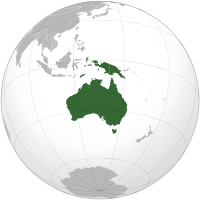 Originally we had planned to only visit Australia and other parts of Oceania. Our goal was Melanesia and Polynesia. But we had to put our heads together and come up with more realistic plans because we just cannot see every one of our dream destinations during our trip around the world. It is not, of course, that we do not want to, but we have a budget and it is not inflatable, unfortunately. And certainly, we firmly believe that what we miss on this trip, we can catch up at any time in the future. The main goal of our round the world trip is to learn and enjoy the trip. We are sure that the travel plan we created will allow us to do so. On this continent we will head from Asia where we will come back again later for further discoveries. Australia is almost 100 times greater than the Czech Republic. When we tried to imagine that, it was simply beyond us. You may think that our country is small but have you ever tried to travel across it in each direction? It is not so small then. So try to travel across a country which is almost 100 times larger, it takes so much time. Hence we had to choose only certain places to visit there. Due to the fact that we will be there for the first time we do not want to miss the main famous places and attractions in Australia. Perhaps the biggest experience will be diving at the Great Barrier Reef, by the way it was the reason that we first started diving so we will be able to enjoy this underwater spectacle. New Zealand is located only about 2000 km from Australia. And since it seems like a country full of natural beauty and tranquility, we said to each other that we will travel in New Zealand by car. In fact, a camper van or RV, which is probably the best choice of how to travel New Zealand. With this type of travel it is especially amazing that you are not dependant on anyone else and can manage the program according your current mood. We plan to travel all around New Zealand. In our view we have mainly national parks and places associated with the history and indigenous people of this country. Holidays in New Zealand will be special for us, because we will probably celebrate Christmas and New Year here. Perhaps we can find refuge with the locals and experience holidays with them, specific to this region.